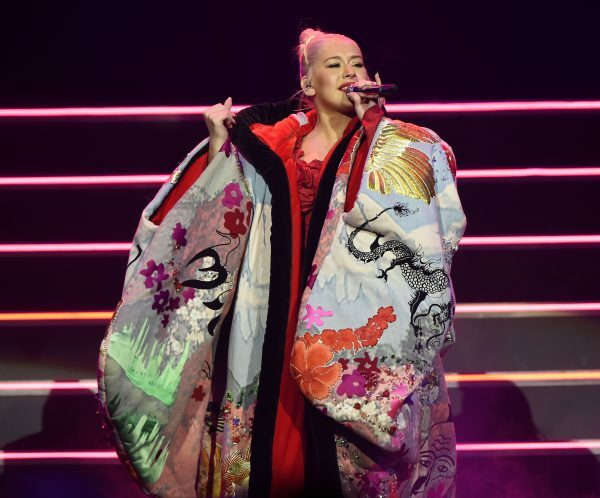 This past Saturday night on the 6th of October, 2018, Christina Aguilera brought her Liberation Tour to Mohegan Sun Arena, which is located inside Mohegan Sun Casino in Uncasville, Connecticut. The time listed on the tickets was 8:00 PM and they started letting people into the arena at 7 PM sharp, which may have had something to do with the large crowd forming outside the arena’s main entrance. My mother and I entered shortly after they started letting people in and arrived at our seats not long after that. I thought the show would start at 8 PM, regardless of whether or not there was an opening act. This was not to be, however. Christina didn’t take to the stage until 9 PM, following a 5-minute countdown projected onto the curtains in front of the stage. It definitely served to get everyone excited so don’t be surprised if you see other artists doing the same soon. In any case, 9 PM is a normal time for a headliner to go on, of course, but it would’ve been nice if she’d brought out someone in support to keep us entertained before she took to the stage. There must be a thousand artists who’d love to open for Xtina, as she usually signs her name. The thing about this Mylène Farmer quality, and why I mention it now, is that Christina Aguilera seemed to have that effect on her audience Saturday night. People of all ages were mesmerized. It’s hardly surprising, however, when you consider that Christina last toured “over ten years ago,” as she told the packed house, and many of those in attendance were probably still in diapers back then, she joked. You could definitely see the different generations present. I’m in my mid-40’s, at the risk of making myself sound ancient, and Christina and Britney were all the rage when I was in my ‘20’s. My friend Dan and I listened to a lot of pop music in our twenties that was clearly intended for people a decade younger than ourselves. We simply listened to what we thought sounded good. He preferred Britney, but I was always all about Christina. Saturday night’s show began with video footage of a little girl running around, playing outside. Every so often the girl would disappear and we’d see Christina as she is today instead. I don’t know if the child is one of Christina’s children or if a director simply held auditions and found a little girl who looked like Christina might have as a child, but it was adorable. As they seemed to play hide and seek, “Searching for Maria,” the opening to Christina’s new album, Liberation, played. Soon, Christina appeared, rising up on a platform, which had the audience screaming louder and louder as more of her appeared. Then “Searching for Maria” went into the song “Maria,” which is perhaps about trying to find the kid in oneself again. “I want to free myself,” Christina sang early in the song but it wasn’t long before the lyrics grew dark. “This lonely life I’ve created / Is that the price that I’m paying,” she belted, her voice a veritable force to be reckoned with. While “Maria” played, a couple of Christina’s dancers – they might have even been mimes – went through the audience, handing out roses. That lead into a punchy, extra-sexed up version of one of Christina’s very first hits, “Genie In A Bottle.” Interestingly, there were some trap music hi-hats riding parts of the song, which had clearly been given a modern makeover. After “Genie” there was a slight pause and “The Queen is Back” was projected onto the curtains that were frequently on the stage while the band continued to play. When the curtains were moved, Christina was sitting atop what looked like a sci-fi Queen’s throne that she’d found 50 years in the future. “Dirrty” followed and had the crowd screaming along. It had always been something of a dancer’s anthem and it wasn’t hard to spot the dancers in the crowd moving along to the beat. Next were snippets of “What A Girl Wants” and “Come On Over (All I Want is You).” She played maybe 40 seconds of “What A Girl Wants” then about half of “Come On Over,” and it seemed like she was only doing so to give us some idea of what we would not be hearing that night. Then she played what seemed to be called “Sick of Sittin’” followed by “Can’t Hold Us Down,” a track from the Stripped album, which would be well-represented throughout the set. A few songs later, Christina played a long medley of three of the songs from my favorite of her albums, Bionic. Those were “Elastic Love,” “Woohoo,” and “Bionic.” I’d always wished that she’d tour that album, but I was satisfied just to hear significant portions of three of its best tracks performed live. It must also be said that Christina’s band was phenomenal. I especially liked the loud beats, which made you feel like you were truly experiencing the same thing Christina was experiencing. Those drums were clobbering all of us, of course. In a good way. The first song of the encore was “Unless it’s With You,” the sweet and sentimental song going, “I don’t want to get married / unless it’s with you” and in that sprit Christina brought a couple of newlyweds up on stage, Rina and Tim, who’d gotten engaged after only knowing each other for four months. They remained on stage while Christina finished the song and were sent away with hugs. There were several songs performed that I haven’t even hinted at here because I hate reviews that walk you through every little step of the show, giving you the whole darn setlist by the time they’re finished. It’s my hope that you’ll find my review just enticing enough to make you get up and go see Christina while you still have the chance. Who knows when she’ll finally get around to touring again after this. If there’s one thing that bothered me about the show it was the lack of Jumbotrons. Whenever you go to a show at Mohegan, or any arena, they have one on each end of the stage, raised high in the air so that even those in the cheap(er) seats can see them perfectly. Well, instead of having Jumbotrons on, Christina opted to just show footage of what was happening on stage occasionally on the screens behind her. But I don’t think she did that for more than five songs, which had me constantly wishing that I could see her face. It reminded me of when I first started going to concerts in the mid’80’s. Back when you had to get a really good seat if you wanted to see the artists’ facial expressions. If I’d known the Jumbotrons weren’t going to be working, I would’ve brought a small pair of binoculars. Oh well, it was a great time even if you couldn’t always see how Christina herself was feeling. I was at this show and it was the best concert I’ve ever been to for certain. I’m elated to see Christina out on the road, doing what she does best. SING. Unlike Britney who just dances and lip synchs. When I go to a concert, I want the singer to use their voice, not a computer. I saw Xtina the other night and was only 20 rows back on the floor and I have no doubt that she was singing live.